"Thank you for making Trashed... a job well done"
Trashed is also available through Kanopy, the leading supplier of DVD and online video to Australian/NZ Libraries! “Trashed” is a provocative investigation of one of the fastest growing industries in North America. The garbage business. 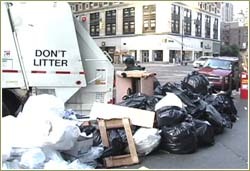 The film examines a fundamental element of modern American culture…the disposal of what our society defines as “waste.” It is an issue influenced by every American, most of whom never consider the consequences. Nor, it seems, the implications to our biosphere. At times humorous, but deeply poignant, “Trashed” examines the American waste stream fast approaching a half billion tons annually. What are the effects all this waste will have on already strained natural resources? Why is so much of it produced? While every American creates almost 5 pounds of it every day, who is affected most? And who wants America to make more?